“What’s with this packaging?” you ask. That pouch has a purpose; to keep the bread fresh without requiring freezing before it’s opened, or the need for nasty preservatives or chemicals that we are so much against. The outer plastic bag around the pouch is there for you to store the bread and pouch in, inside your fridge or on the counter, once it’s opened. The pouch and bag also help protect your bread, in the fridge, from getting mashed when your moving things around. You may also store your bread in your own airtight container, whatever works best for you. To open the bread, remove the pouch from the plastic bag and put the bread flat side up/upside down. Cut three sides– one short and two long, and fold over the flap to remove the slices you want. 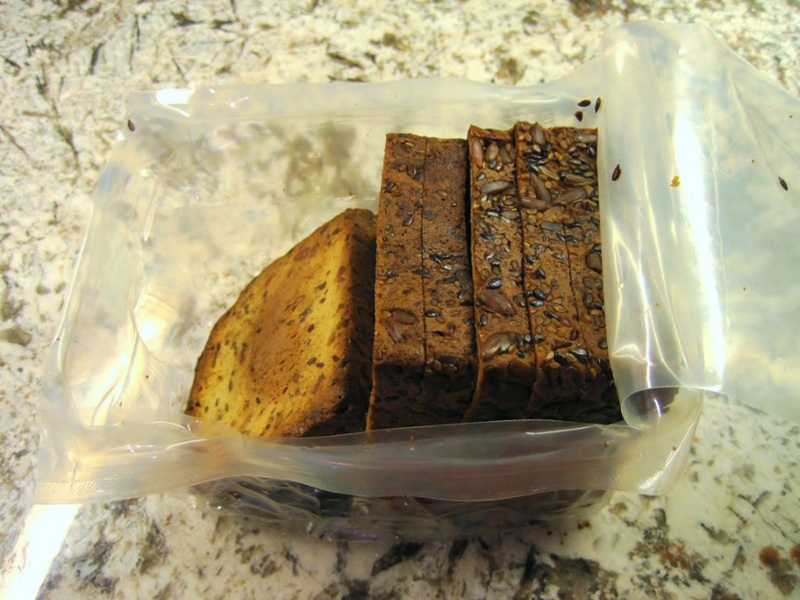 Then slip the pouch, and remaining bread, back into the plastic outer bag, and store it in the fridge. It will last for 5-7 days. The bread is great fresh out of the package or try it toasted. There is no need to freeze our unopened gluten-free bread. All our gluten-free breads are made in a dedicated wheat-free, gluten-free, dairy-free, peanut free, tree-nut free and kosher certified facility.